I have already written about another attack on the innocent; the Boston Marathon massacre of 2013. I am sad that I am writing this kind of post again. The murder of civilians in Paris on Friday 13, 2015 was a heinous crime. Jug, 5.12 inches. The personifications of Peace and Plenty flank a large monument with the inscription "Peace of Europe Signed at Paris May 30, 1814", surmounted by the GR initials of George III. 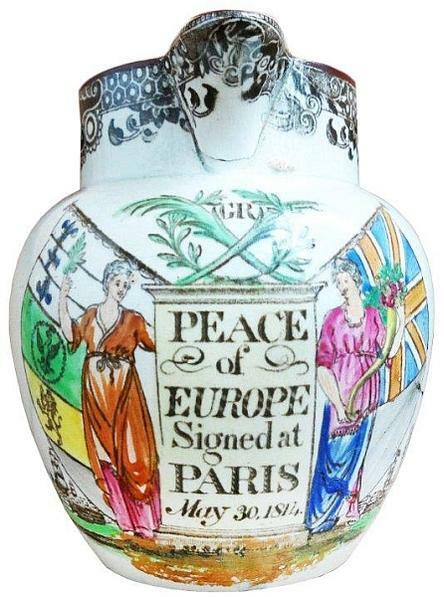 There really isn't much 19th century transferware with a Paris pattern, but I did find "Peace of Europe Signed at Paris, May 30, 1814" in the Pattern and Source Print Database of the Transferware Collectors Club. It illustrates both the sadness and the irony of a fragile peace treaty. The pattern commemorates what appeared to be peace when Napoleon abdicated as Emperor in April 1814, and the Treaty of Paris was signed by the Allies; Britain, Prussia, Russia, Austria, Sweden, and Portugal. Instead, in February, 1815, Napoleon escaped from exile on Elba, and was welcomed back by the French. War broke out again, and didn't culminate until Waterloo in July, 1815. There was a second Treaty of Paris that was signed in November, 1815. Thus, two peace treaties in little more than a year with, of course, war in between. Notice that the second treaty was signed in November, 1815; two hundred years before the recent killings in Paris. I am meandering around what I wanted to say in my first sentence; plus ça change, plus c’est la même chose (the more things change, the more they stay the same).